My dad used to make it (along with his fried eggs with ketchup), but only on special occasions. I like it really thin and crispy, so the edges almost curl up. I don’t put anything on my Spam sandwich — just Spam. But after watching the following video, I’m asking myself why I’ve always sliced Spam on the narrow/short side, rather than the full/larger side. I guess that’s how my dad always did it, that’s why. And my Spam sandwich is served on a flour tortilla, rather than bread. So, does that make it any better? At least I don’t add butter to Spam sandwiches! C’mon, before you scorn me for eating so much mystery meat fat in one sitting, ask yourself when the last time you had ham was. It’s kinda the same, right? Okay, maybe not exactly, but close! What about bacon? Hot dogs? In China, Spam sandwiches are sold at Starbucks as a delicacy. And you know how thin Chinese women are, so it can’t be that bad! If you do a search for Spam recipes, you’ll find millions of them floating around out there on the Internet. So, I’m obviously not alone in my unique craving for a Spam sandwich. Anyways… thanks to that darned Costco shopper’s mentality, I now have 5 more cans of Spam waiting to be eaten! Not sure I’m craving that much of it. But hey, when the mood strikes, you go with it. So… when was the last time you ate Spam? I don’t know the answers to these intriguing Spam questions, do you? I had no idea there was so much cool Spam stuff! More Spam fun & games here too. 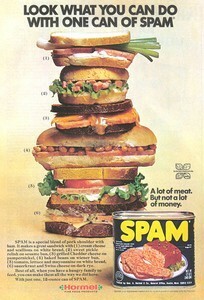 How’s this for a sandwich that utilizes Spam?! What does Spam stand for, and what is it made of?